While you are viewing the underground I will be flying back to London. I will catchup with all of you who have visited and left comments. Today's subway is taking the escalators down to the platform. The Piccadilly line was one of the first deep level lines constructed over 100 years ago. New York City Daily Blog – Stockholm by pixels – Budapest by Andrea Gerak – Fresh Eyes on London – Peter’s Paris. 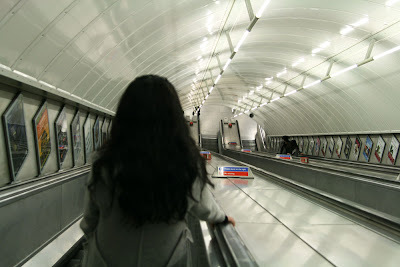 I love descending into the Underground! It is much farther underground than our subway is! Pretty impressive to have this constructed created without any of those modern tools we take for granted. i like the composition , nice shot ! i had never been to London. Watching all the pictures u posted on ur blog gave me and idea how's London like. I love it! I've heard that the London subway is DEEP down underground. Your photo definitely demonstrate that. I cannot count how many times I've been there! You got me on the day I didn't straighten my hair. Seriously it could be if that was a black coat aswell. You must have a good trip in Shanghai. beautiful sight, river looks fresh. It's beautiful! It makes Chicago's tubes look like a puiblic restroom. The thing I love the most about this shot is that - apart the frames at the walls - you can ask: is she going up or down? What an interesting photo. It appears to be horizontal, then at the end, we travel upward. Yet the photos dictate this is going downward. Perfect play on perspectives! I am interested in joining the Subways meme. How did you go about joining?